Set the defence of your structure. Place a huge wall in front and get advanced weapons to resist the assault. Kill cubic soldiers and repair your building. How many waves you can survive? Are you ready for a combat? 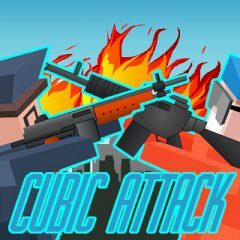 The city has been attacked by cubic soldiers and your building is the last one to capture. Resist the assault and purchase more powerful weapons to face the heavy units of your enemy. Shoot aircrafts, bulldozers and activate the missile to eliminate everyone in the area.